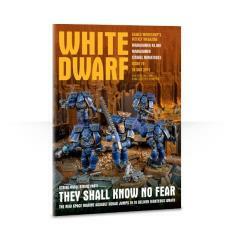 #70 "They Shall Know no Fear"
The armored fist of the Space Marines jumps in! The brand new Space Marine Assault Squad is here and this issue's got a first look, and a stage-by-stage painting guide to have your Assault Marines on the rampage before the enemy knows what’s hit them. Not only that, but this week sees the release of four new Space Marine Upgrades sprues and you can take a look in a stonking Sprues and Glue. Theatre of War brings us an exclusive new mission, perfect for the Space Marines, and Parade Ground takes a look at two of first new Assault Squads to jump in. For all this and more, grab a copy now.